Be the first to share your favorite memory, photo or story of Ouida. This memorial page is dedicated for family, friends and future generations to celebrate the life of their loved one. Mrs. Ouida Fry Bitker, 92, of Peachtree City, GA passed away January 9, 2019. She was born in Clarkesville, GA, the youngest of six children. After graduating from high school, she lived and worked in Clarkesville as well as Atlanta, GA. Her cousin Ray introduced Ouida to his Duke University college roommate, Alexander Bitker, whom she married in Atlanta, July 30, 1949 after a courtship of two years. Ouida and Alex lived for about 20 years in the San Francisco Bay Area, and for another 25 years in Stamford, CT, after Alex took a job in New York City. Ouida and her husband Alex then returned to Georgia for their 20 plus retirement years. She was preceded in death by her husband, Alexander; parents, David & Laura Fry; sister, Edith Fry Gay; brothers, Robert, Walter-B, Bruce & Malcolm. Ouida is survived by her children, Alan Bitker and his wife Barbara Cox of New Haven, CT, Steve Bitker and his wife Alice of Alameda, CA, Laura Kolenberg and her husband Mike of Stamford, CT; grandchildren, Adam Bitker of New Haven. CT, Alexandra Bitker of San Francisco, CA, Mei-Ling Jenks of Alameda, CA, Janelle Bitker of Alameda, CA and Nicole Kolenberg of Stamford, CT; great grandchildren Kayden and Oliver Jenks of Alameda, CA; and numerous nieces and nephews and their families in Northern Georgia and California. Ouida was an exceptionally creative and artistic individual. She was a painter and a weaver, enjoyed photography, sewing, needlepoint and stitchery, flower arranging and many other fine crafts. Every room in her house was marked by her flair for design. Ouida was also the consummate hostess and whether hosting or attending, enjoyed many a cocktail and dinner party. She loved getting all made up, wearing matching outfits coordinated attentively with accessories including her jewelry and her signature scarves. Even in her later years, she made a definitive fashion statement. 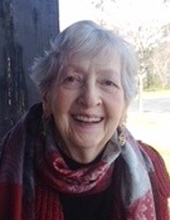 She was a member of the Peachtree City United Methodist Church where she took bible study classes and made many precious friendships that brought her much love and support all the way through her final days. Ouida’s family would to extend their heartfelt gratitude to the staff and caregivers of Ashley Glen Senior Living, who bestowed upon Ouida the most loving and attentive care. A memorial service will be held at the Peachtree City United Methodist Church on a Saturday in March or April. The exact date has not yet been determined but will be made available through the Church in the very near future. Those desiring may make donations to the Peachtree City United Methodist Church Garden of Celebration. To send flowers or a remembrance gift to the family of Ouida Fry Bitker, please visit our Tribute Store. "Email Address" would like to share the life celebration of Ouida Fry Bitker. Click on the "link" to go to share a favorite memory or leave a condolence message for the family.